Cannabinoids suppress neuropathic pain through activation of cannabinoid CB1 and/or CB2 receptors; however, unwanted CB1-mediated cannabimimetic effects limit clinical use. We asked whether CP55,940 [(−)-3-[2-hydroxy-4-(1,1-dimethylheptyl)phenyl]-4-(3-hydroxypropyl)cyclohexanol], a potent cannabinoid that binds with similar affinity to CB1 and CB2 in vitro, produces functionally separable CB1- and CB2-mediated pharmacological effects in vivo. We evaluated antiallodynic effects, possible tolerance, and cannabimimetic effects (e.g., hypothermia, catalepsy, CB1-dependent withdrawal signs) after systemic CP55,940 treatment in a mouse model of toxic neuropathy produced by a chemotherapeutic agent, paclitaxel. The contribution of CB1 and CB2 receptors to in vivo actions of CP55,940 was evaluated using CB1 knockout (KO), CB2KO, and wild-type (WT) mice. Low-dose CP55,940 (0.3 mg/kg daily, i.p. ) suppressed paclitaxel-induced allodynia in WT and CB2KO mice, but not CB1KO mice. Low-dose CP55,940 also produced hypothermia and rimonabant-precipitated withdrawal in WT, but not CB1KO, mice. In WT mice, tolerance developed to CB1-mediated hypothermic effects of CP55,940 earlier than to antiallodynic effects. High-dose CP55,940 (10 mg/kg daily, i.p.) produced catalepsy in WT mice, which precluded determination of antiallodynic efficacy but produced sustained CB2-mediated suppression of paclitaxel-induced allodynia in CB1KO mice; these antiallodynic effects were blocked by the CB2 antagonist 6-iodopravadoline (AM630). High-dose CP55,940 did not produce hypothermia or rimonabant-precipitated withdrawal in CB1KO mice. Our results using the mixed CB1/CB2 agonist CP55,940 document that CB1 and CB2 receptor activations produce mechanistically distinct suppression of neuropathic pain. Our study highlights the therapeutic potential of targeting cannabinoid CB2 receptors to bypass unwanted central effects associated with CB1 receptor activation. Peripheral neuropathic pain induced by chemotherapy detrimentally impacts the lives of cancer patients and is one of the major side effects responsible for discontinuation of anticancer treatment (Windebank and Grisold, 2008). To date, the mechanisms underlying chemotherapy-induced neuropathic pain remain poorly understood (Windebank and Grisold, 2008). Additional challenges for the management of chemotherapy-induced neuropathy include limited efficacy and significant side effects of existing medications (Pachman et al., 2011). Thus, identification of therapeutic strategies that are both safe and effective for managing chemotherapy-evoked neuropathic pain remains an unmet clinical need. Cannabinoids produce antinociceptive effects in preclinical models of neuropathic pain (Herzberg et al., 1997; Ibrahim et al., 2003; Guindon and Hohmann, 2009; Kinsey et al., 2009; Pertwee, 2009; Schlosburg et al., 2009); however, unwanted psychotropic effects of cannabinoids limit their potential clinical use (Ben Amar, 2006; Pertwee, 2009; Dhopeshwarkar and Mackie, 2014). Two major subtypes of cannabinoid receptors, CB1 and CB2, are the key receptors responsible for the pharmacological effects of cannabinoids (Mackie, 2006). Both CB1 and CB2 receptors are G-protein–coupled receptors whose signaling pathways include inhibition of adenylyl cyclase and activation of mitogen-activated protein kinases (Mackie, 2006). CB1 receptors are predominantly located in the central nervous system (CNS), whereas CB2 receptors are found primarily in immune cells (Galiegue et al., 1995; Schatz et al., 1997; Marsicano and Lutz, 1999; Onaivi et al., 2006) and are upregulated in the CNS in response to inflammation or injury (Zhang et al., 2003; Maresz et al., 2005). Evaluation of the receptor mechanisms underlying therapeutic and psychotropic effects of cannabinoids, after both acute and chronic administration, may facilitate the development of safe and effective cannabinoid-based pharmacotherapies (Ben Amar, 2006; Pertwee, 2009). CP55,940 [(−)3-[2-hydroxy-4-(1,1-dimethylheptyl)phenyl]-4-(3-hydroxypropyl)cyclohexanol] is a potent nonselective synthetic cannabinoid that has equal affinity for both CB1 and CB2 receptors in vitro (Felder et al., 1995; Abood et al., 1997; Griffin et al., 2000). Whereas CB2 agonists exhibit strong ligand-biased selectivity for different signal transduction pathways (Atwood et al., 2012), CP55,940 is a balanced agonist that has not shown functional selectivity at CB1 or CB2 (Howlett et al., 2002; Atwood et al., 2012). Thus, CP55,940, used in combination with CB1 knockout (KO) and CB2KO mice, represents a useful pharmacological tool for studying the functions of CB1 and CB2 receptors in vivo. CP55,940 has been reported to possess antinociceptive efficacy in various preclinical pain models, including acute pain, inflammatory pain, and neuropathic pain induced by traumatic nerve injury (Lichtman and Martin, 1997; Hohmann et al., 1999; Romero et al., 2002; Scott et al., 2004; Choong et al., 2007; Sain et al., 2009). Pharmacological antagonism of CB1 receptors alone (Lichtman and Martin, 1997; Romero et al., 2002; Choong et al., 2007) or of both CB1 and CB2 receptors (Scott et al., 2004) blocks the antinociceptive effects of CP55,940 in rats; however, a study using CB1KO and CB2KO mice reported that the antinociceptive effects of systemic CP55,940 (at 0.3 mg/kg, i.p. ), administered acutely, is mediated by CB1 but not by CB2 receptors (Sain et al., 2009). This finding led to the conclusion that agonist activity at CB2 is not relevant to antinociceptive effects of mixed CB1/CB2 agonists, at least following systemic administration. By contrast, we hypothesized that, due to the abundance of CB1 receptors (relative to CB2 receptors) in the CNS, higher doses of mixed cannabinoids are required to activate CB2 receptors (compared with the dose that is sufficient to activate CB1) and that CB2-mediated antinociceptive effects, rather than being absent, are masked by CB1-mediated catatonia associated with mixed cannabinoid agonists. The differences between the in vitro and in vivo profiles of CP55,940 raise questions about the differential roles and functions of CB1 and CB2 receptors in vivo, particularly in persistent pain states in which chronic dosing is required for clinical use. In the present study, we investigated the contribution of cannabinoid CB1 and CB2 receptor subtypes to the in vivo actions of the mixed cannabinoid CP55,940 in a mouse model of chemotherapy-induced neuropathy using transgenic (i.e., CB1KO, CB2KO) and wild-type (WT) mice. We evaluated antinociceptive effects, possible tolerance, and typical CNS-associated side effects (e.g., hypothermia, catalepsy, and physical withdrawal) associated with chronic administration of CP55,940 at multiple doses. CB1KO mice were used to test the hypothesis that CB2-mediated signaling can be engaged by mixed cannabinoids in vivo to produce sustained antiallodynic efficacy without producing side effects. Thus, under conditions in which confounding effects of CP55,940 at CB1 receptors are absent (e.g., in CB1KO mice), CB2-mediated effects can be fully characterized to ascertain the therapeutic potential of targeting CB2 receptors. Adult CB1KO and WT littermates on a CD1 background and adult CB2KO and WT littermates on a C57BL/6J background weighing 26–35 g and of both sexes, were used in these experiments. CB2KO (B6.129P2-CNR2(tm1Dgen/J)) and corresponding WT (C57BL/6J) mice were originally purchased from Jackson Laboratory (Bar Harbor, ME). CB1KO mice were generated as previously described (Ledent et al., 1999), whereas corresponding WT littermates were periodically outcrossed with CD1 mice (strain number 022) from Charles River Laboratories (Wilmington, MA) to maintain genetic diversity. Animals were single housed in a temperature-controlled facility (73 ± 2°F, 45% humidity, regular 12-hour light/dark cycle, lights on at 7 AM), with food and water ad libitum. All experimental procedures were approved by the Bloomington Institutional Animal Care and Use Committee of Indiana University and followed the guidelines of the International Association for the Study of Pain (Zimmermann, 1983). Paclitaxel was purchased from Tecoland Corporation (Irvine, CA) and was dissolved in cremophor-vehicle (1:1:18 ratio of cremophor/ethanol/saline). cremophor EL, ethanol, dimethyl sulfoxide, and acetone were purchased from Sigma-Aldrich (St. Louis, MO). Alkamuls EL-620 was obtained from Rhodia (Cranbury, NJ). Saline was purchased from Aqualite System (Hospira, Lake Forest, IL). (–)-CP55,940 (CP55,940) (Compton et al., 1992) was provided by the National Institute on Drug Abuse or purchased from Santa Cruz Biotechnology (Dallas, TX). Rimonabant (Yoshioka et al., 1989) was provided by the National Institute on Drug Abuse. AM630 (6-iodopravadoline) (Ross et al., 1999) was purchased from Cayman Chemical Company (Ann Arbor, MI). CP55,940, rimonabant, and AM630 were dissolved in vehicle (5:2:2:16 ratio of dimethylsufoxide/alkamuls EL-620/ethanol/saline) and were administered intraperitoneally to mice in a volume of 5 ml/kg. Animals were randomly assigned to experimental groups and tested by an experimenter blinded to experimental conditions. Paclitaxel (4 mg/kg, i.p.) was administered four times on days 0, 2, 4, and 6 after initiation of paclitaxel dosing in a volume of 6.67 ml/kg (cumulative dose: 16 mg/kg, i.p.) to induce neuropathy, as previously described (Ward et al., 2011; Deng et al., 2015). The control group received an equivalent volume of CR-vehicle. Development of paclitaxel-induced mechanical and cold allodynia was assessed on days 0, 4, 7, and 15 after the initiation of paclitaxel dosing. Effects of pharmacological manipulations were evaluated over 9 consecutive days of repeated once-daily injections. Chronic dosing was initiated during the maintenance phase of paclitaxel-induced allodynia (i.e., from day 16 to day 24 after initial paclitaxel injection), and behavioral responsiveness was evaluated 30 minutes after injection of drug or vehicle. In experiment 1, we evaluated the antiallodynic effects of chronic CP55,940 (0.3 mg/kg daily, i.p. × 8 days) in paclitaxel-treated CB1KO, CB2KO, and respective WT littermates. Responsiveness to mechanical and cold stimulation was evaluated on treatment days 1, 4, and 8. To examine the time course of the development of antinociceptive tolerance, a subset of WT animals were treated with CP55,940 (0.3 mg/kg daily, i.p. × 16 days) and assessed for mechanical and cold responsiveness on treatment days 1, 4, 8, 11, and 16. In experiment 2, we investigated possible side effects of CP55,940 (0.3 mg/kg daily, i.p. × 9 days) in paclitaxel-treated CB1KO and WT (CD1) mice. Rectal temperature was evaluated on treatment days 2 and 7. CB1-mediated cannabinoid withdrawal symptoms (i.e., paw tremors, headshakes, and scratching bouts) elicited by challenge with rimonabant (10 mg/kg, i.p.) in comparison with vehicle were examined on treatment day 9. In experiment 3, we assessed the acute effects of CP55,940 (0.3, 1, 3, and 10 mg/kg, i.p.) on mechanical and cold allodynia in paclitaxel-treated CB1KO mice. Both CB1KO and WT mice receiving CP55,940 (0.3 and 3 mg/kg, i.p.) were evaluated for catalepsy in the ring test. CP55,940 (3 mg/kg, i.p.) produced motor impairment and sedation in WT littermates that precluded the assessment of responsiveness to mechanical and cold stimulation. In experiment 4, we assessed the antiallodynic effects and possible side effects of chronic CP55,940 (3 mg/kg daily, i.p. × 9 days) in paclitaxel-treated CB1KO mice. Responsiveness to mechanical and cold stimulation was evaluated on treatment days 1, 4, and 8. Rectal temperature was evaluated on treatment days 2 and 7. Withdrawal symptoms evoked by rimonabant (10 mg/kg, i.p.) challenge were examined on treatment day 9. In experiment 5, we examined the receptor mechanism underlying the antiallodynic effects of CP55,940 (3 mg/kg daily, i.p. × 8 days) in CB1KO mice. Paclitaxel-treated CB1KO mice that received vehicle, CP55,940 (3 mg/kg daily, i.p. × 8 days) alone or coadministered with AM630 (5 mg/kg daily, i.p. × 8 days) were examined. Withdrawal thresholds (in grams) to mechanical stimulation were measured in duplicate for each paw using an electronic von Frey anesthesiometer supplied with a 90-g range probe (IITC Life Science Inc., Woodland Hills, CA) as described previously (Deng et al., 2012, 2015). Briefly, mice were individually placed in transparent plastic chambers on an elevated metal mesh table and habituated to the testing apparatus for 30 minutes before testing. When animals ceased exploratory behaviors, a force was applied to the midplantar region of the hind paw by a semiflexible tip connected to the anesthesiometer. Mechanical stimulation was terminated on paw withdrawal. Response time (in seconds) to cold stimulation was assessed in triplicate for each paw by the acetone method as described previously (Deng et al., 2015). Briefly, mice were individually placed underneath transparent plastic chambers on an elevated metal mesh table. After habituation, an acetone bubble that formed at the end of a blunt 1-ml syringe was gently presented onto the plantar surface of the hind paw. Time that the animal spent attending to (i.e., elevating, licking, biting, or shaking) the acetone-stimulated paw was measured over a 60-second observation period. Evaluation of Cannabinoid Withdrawal Symptoms. WT mice were treated chronically with vehicle or CP55,940 (0.3 mg/kg per day, i.p.) for 9 days. CB1KO mice were treated chronically with vehicle or CP55,940 (0.3 or 3 mg/kg daily, i.p.) for 9 days. On treatment day 9, 30 minutes after the final treatment injection, animals were first challenged with vehicle and 30 minutes later challenged with the CB1 antagonist rimonabant (10 mg/kg, i.p.). Mice were video-recorded, and the numbers of paw tremors, headshakes, and scratching bouts were scored over 30 minutes after each challenge by an experimenter blinded to experimental conditions, as previously described (Cook et al., 1998; Deng et al., 2015). Rectal temperature (°C) was measured using a thermometer (Physitemp Instruments Inc., Clifton, NJ) equipped with a mouse rectal probe (Braintree Scientific Inc., Braintree, MA) as previously described (Deng et al., 2015). Catalepsy was assessed using the ring test as previously described (Pertwee, 1972). Immobility latency (in seconds) that the animal spent motionless on the ring during a 5-minute observation period was recorded. Analysis of variance for repeated measures was used to determine the time course of allodynia and chronic drug effects. The sphericity-assumed correction was applied to all repeated factors; degrees of freedom for significant interactions are reported as uncorrected values. One-way analysis of variance was used to identify the source of significant interactions and compare postinjection responses with prepaclitaxel baselines, followed by Bonferroni post hoc tests or two-tailed t tests, as appropriate. No gender differences were detected in chemotherapy-induced responses to mechanical or cold stimulation (P > 0.41 for all comparisons) or in the effects of CP55,940 (P > 0.15 for all comparisons); therefore, results from both genders were pooled for statistical analyses. Statistical analyses were performed using IBM-SPSS Statistics version 22.0 (SPSS Inc., Chicago, IL). P < 0.05 was considered significant. Paclitaxel-Induced Allodynia Developed Similarly in WT, CB1KO, and CB2KO Mice. Before paclitaxel treatment, there were no genotype or gender differences in responses to mechanical (CB1: P = 0.70, Fig. 1A; CB2: P = 0.22; Fig. 1C) or cold stimulation (CB1: P = 0.15, Fig. 1B; CB2: P = 0.89; Fig. 1D). Development of paclitaxel-induced painful neuropathy. (A and C) Mechanical and (B and D) cold allodynia developed equivalently in (A and B) CB1KO, (C and D) CB2KO, and corresponding WT littermates after paclitaxel treatment. Nonchemotherapy controls received CR-vehicle in lieu of paclitaxel. Arrows show timing of paclitaxel or CR-vehicle injections (inj). Data are expressed as mean ± S.E.M. (n = 5–31 per group). *P < 0.05 versus CR-vehicle control, repeated measures analysis of variance (ANOVA), and one-way ANOVA at each time point. Paclitaxel decreased thresholds to mechanical stimulation (F3,62 = 72.33, P < 0.0001; Fig. 1A) and increased response time to cold stimulation (F3,62 = 19.04, P < 0.0001; Fig. 1B) in CB1KO and WT littermates. Similarly, paclitaxel induced hypersensitivity to mechanical (F3,33 =140.24, P < 0.0001; Fig. 1C) and cold (F3,88 = 71.71, P < 0.0001; Fig. 1D) stimulation in both CB2KO and WT littermates. Mechanical and cold allodynia were established in mice treated with paclitaxel relative to CR-vehicle group beginning on day 4 and were sustained throughout the testing interval in CB1KO, CB2KO, and WT mice (P < 0.0001). Paclitaxel-induced mechanical and cold allodynia developed equivalently in CB1KO and WT mice, as well as in CB2KO and WT mice across all time points (P = 1.00), consistent with our previously published work (Deng et al., 2015). Chronic Low-Dose CP55,940 Suppressed Paclitaxel-Induced Allodynia in WT but Not in CB1KO Mice. In WT mice, chronic low-dose treatment with CP55,940 (0.3 mg/kg daily, i.p.) reversed paclitaxel-induced mechanical (F1,9 = 91.73, P < 0.0001; Fig. 2A) and cold (F1,9 = 26.84, P < 0.002; Fig. 2B) allodynia relative to vehicle (P < 0.0001 for all comparisons) and preinjection levels (F4,36 = 18.58, P < 0.0001 mechanical; F4,36 = 17.11, P < 0.0001 cold). The antiallodynic effects of low-dose CP55,940 were stable from treatment day 1 to day 8 (F2,18 = 0.42, P = 0.66 mechanical; F2,18 = 1.50, P = 0.25 cold). Low-dose CP55,940 fully suppressed paclitaxel-induced allodynia and restored responses to prepaclitaxel baseline levels (F3,2 = 2.24, P = 0.12 mechanical; F3,20 = 0.93, P = 0.44 cold; Fig. 2, A and B) in WT mice. Low-dose CP55,940 suppressed paclitaxel-induced neuropathic pain in WT and CB2KO but not in CB1KO mice. (A–D) CP55,940 (0.3 mg/kg daily, i.p. × 8 days) reversed paclitaxel-induced (A and C) mechanical and (B and D) cold allodynia in (A and B) WT (CD1) littermates but not in (C and D) CB1KO mice. (E–F) CP55,940 (0.3 mg/kg daily, i.p. × 8 days) attenuated paclitaxel-induced (E) mechanical and (F) cold allodynia with similar efficacy in CB2KO and WT (C57BL/6J) littermates. BL, prepaclitaxel baseline; PTX, postpaclitaxel baseline; Veh, vehicle. Data are expressed as mean ± S.E.M. (n = 5–7 per group). *P < 0.05 versus vehicle, two-tailed t test or one-way analysis of variance (ANOVA) followed by Bonferroni post hoc test. #P < 0.05 versus prepaclitaxel baseline, repeated measures ANOVA. By contrast, in CB1KO mice, CP55,940 (0.3 mg/kg daily, i.p.) failed to attenuate paclitaxel-evoked mechanical (F1,8 = 0.31, P = 0.60; Fig. 2C) or cold hypersensitivities (F1,8 = 1.79, P = 0.22; Fig. 2D) relative to vehicle (P > 0.07 for all comparisons) on any day (F4,32 = 0.93, P = 0.46 mechanical; F4,32 = 0.98, P = 0.43 cold). Chronic Low-Dose CP55,940 Attenuated Paclitaxel-Induced Allodynia in CB2KO Mice. Chronic low-dose treatment with CP55,940 (0.3 mg/kg daily, i.p.) suppressed paclitaxel-induced mechanical (F3,21 = 88.71, P < 0.0001; Fig. 2E) and cold (F3,21 = 62.59, P < 0.0001; Fig. 2F) allodynia relative to vehicle (P < 0.0001 for all comparisons) and preinjection levels (F12,84 = 30.20, P < 0.0001 mechanical; F12,84 = 20.81, P < 0.0001 cold) in both CB2KO and WT mice. CP55,940-induced antiallodynic effects were stable from treatment day 1 to 8 (F6,42 = 0.67, P = 0.67 mechanical; F6,42 = 0.46, P = 0.83 cold) and normalized responses to prepaclitaxel levels (WT: F3,24 = 0.15, P = 0.93 mechanical, F3,24 = 0.96, P = 0.43 cold; CB2KO: F3,16 = 1.19, P = 0.34 mechanical, F3,16 = 0.41, P = 0.75 cold; Fig. 2, E and F). Low-dose CP55,940 reversed paclitaxel-induced allodynia with similar efficacy in CB2KO and WT mice at all time points (P = 1.00 for all comparisons; Fig. 2, E and F). Tolerance Developed to the Antiallodynic Effects of Low-Dose CP55,940. To further evaluate whether tolerance develops to the antiallodynic effects of low-dose CP55,940 (0.3 mg/kg daily, i.p. ), a subset of WT mice were tested in a 16-day once-daily chronic dosing paradigm. In WT mice, CP55,940 (0.3 mg/kg daily, i.p.) suppressed paclitaxel-evoked mechanical (F1,6 = 78.01, P < 0.0001; Fig. 3A) and cold (F1,6 = 28.58, P < 0.01; Fig. 3B) allodynia relative to vehicle in a time-dependent manner (F6,36 = 14.53, P < 0.0001 mechanical; F6,36 = 25.08, P < 0.0001 cold). CP55,940 (0.3 mg/kg daily, i.p.) no longer suppressed paclitaxel-induced allodynia relative to vehicle after 11 days of chronic injection (P > 0.10 for all comparisons) in WT mice (Fig. 3, A and B). Tolerance developed to the antiallodynic effects of low-dose CP55,940 in WT mice. CP55,940 (0.3 mg/kg per day, i.p.) failed to suppress paclitaxel-induced (A) mechanical or (B) cold allodynia on day 11 of chronic dosing in WT mice. BL, prepaclitaxel baseline; PTX, postpaclitaxel baseline; Veh, vehicle. Data are expressed as mean ± S.E.M. (n = 4 per group). *P < 0.05 versus vehicle, two-tailed t test. #P < 0.05 versus prepaclitaxel baseline, repeated measures analysis of variance. Chronic Low-Dose CP55,940 Produced Transient Hypothermia in Paclitaxel-Treated WT but Not CB1KO Mice. Chronic low-dose administration of CP55,940 (0.3 mg/kg daily, i.p.) decreased body temperature relative to vehicle on treatment day 2 (P < 0.0001), but not day 7 (P = 0.20), in paclitaxel-treated WT mice (Fig. 4A). Thus, tolerance developed to the hypothermic effect of low-dose CP55,940 after repeated dosing. By contrast, the same dosing paradigm failed to alter body temperature in paclitaxel-treated CB1KO mice on any day tested (P > 0.07; Fig. 4B), consistent with classic CB1-mediated hypothermia. Chronic low-dose CP55,940 produced transient hypothermia in WT but not CB1KO mice. (A) CP55,940 (0.3 mg/kg daily, i.p. × 8 days) decreased body temperature in paclitaxel-treated WT mice on treatment day 2 but not day 7. (B) CP55,940 (0.3 mg/kg daily, i.p. × 8 days) did not alter body temperature in paclitaxel-treated CB1KO mice. Veh, vehicle. Data are expressed as mean ± S.E.M. (n = 4–6 per group). *P < 0.05 versus vehicle, two-tailed t test. 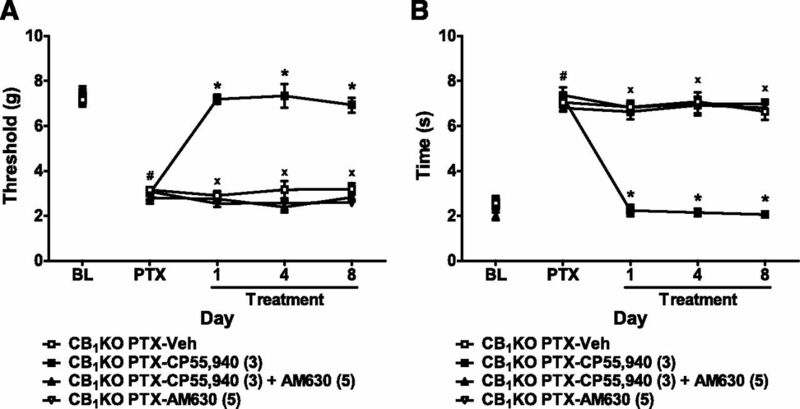 Chronic Low-Dose CP55,940 Produced Cannabinoid Withdrawal Signs in Paclitaxel-Treated WT but Not CB1KO Mice. In paclitaxel-treated WT mice, rimonabant (10 mg/kg, i.p.) challenge produced prototypical CB1-mediated withdrawal signs, such as paw tremors (F3,20 = 57.79, P < 0.0001) and headshakes (F3,20 = 8.59, P < 0.002) in mice treated chronically with low-dose CP55,940 (0.3 mg/kg daily, i.p.) relative to vehicle challenge (P < 0.01) and relative to the vehicle group (P < 0.01; Fig. 5A). 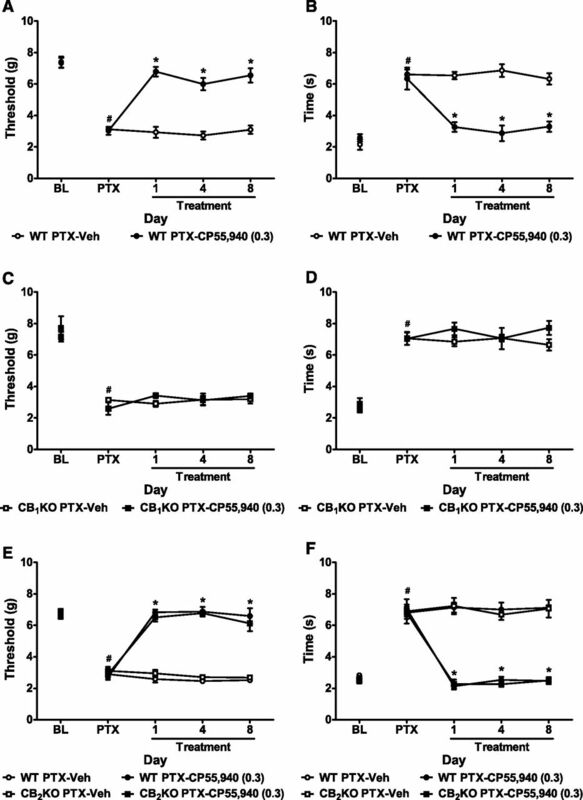 Challenge with rimonabant, but not vehicle, elicited scratching behaviors in paclitaxel-treated WT animals that received chronic administration of vehicle or CP55,940 (F3,20 = 7.88, P < 0.002); WT mice treated with chronic CP55,940 (0.3 mg/kg daily, i.p.) showed more rimonabant-produced scratching behaviors compared with the vehicle group (P < 0.05; Fig. 5A). Rimonabant precipitated withdrawal signs in paclitaxel-treated WT but not CB1KO mice receiving chronic low-dose CP55,940. Challenge with the CB1 antagonist rimonabant (10 mg/kg, i.p.) elicited paw tremors, headshakes, and scratching bouts in paclitaxel-treated (A) WT but not (B) CB1KO mice receiving CP55,940 (0.3 mg/kg daily, i.p. × 9 days). PTX, postpaclitaxel baseline; Veh, vehicle. Data are expressed as mean ± S.E.M. (n = 4–7 per group). xP < 0.05 versus Veh + Rim (chronic vehicle treatment and challenged by rimonabant); $P < 0.05 versus Veh + Veh (chronic vehicle treatment and challenged by vehicle), one-way analysis of variance followed by Bonferroni post hoc test or two-tailed t test. By contrast, rimonabant challenge did not elicit paw tremors (F3,12 = 0.62, P = 0.62), headshakes (F3,12 = 1.80, P = 0.20), or scratching bouts (F3,12 = 1.34, P = 0.31) relative to vehicle challenge in CB1KO mice receiving either chronic CP55,940 (0.3 mg/kg daily, i.p.) or chronic vehicle (Fig. 5B), suggesting that rimonabant-induced scratching in the vehicle-treated mice is mediated by CB1 receptors. Acute High-Dose CP55,940 Produced Catalepsy and Severe Hypothermia in WT but Not in CB1KO Mice. In paclitaxel-treated WT mice, a higher dose (3 mg/kg, i.p.) of CP55,940, administered acutely, induced catalepsy (F2,14 = 391.89, P < 0.0001; Fig. 6A) and hypothermia (F2,14 = 35.59, P < 0.0001; Fig. 6C) relative to either vehicle (P < 0.0001) or low-dose CP55,940 (0.3 mg/kg, i.p.) treatment (P < 0.02). By contrast, in paclitaxel-treated CB1KO mice, neither doses of CP55,940 (0.3 or 3 mg/kg, i.p.) altered immobility latency (F2,12 = 0.75, P = 0.50; Fig. 6B) or body temperature (F2,12 = 1.19, P = 0.34; Fig. 6D) relative to vehicle treatment. High-dose CP55,940 produced catalepsy and hypothermia in paclitaxel-treated WT but not CB1KO mice. (A and C) Acute high-dose treatment with CP55,940 (3 mg/kg, i.p.) 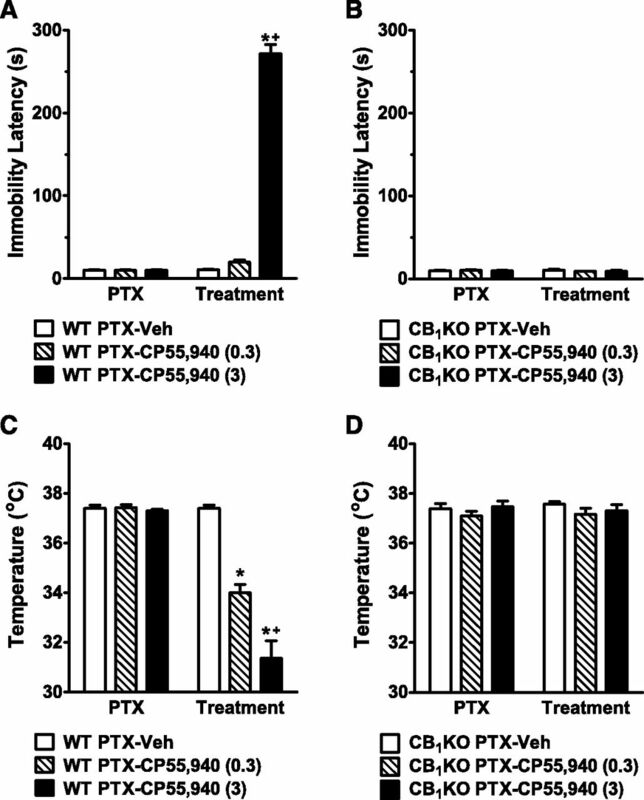 induced (A) catalepsy and (C) hypothermia in paclitaxel-treated WT mice. (B and D) Acute high-dose treatment with CP55,940 (3 mg/kg, i.p.) did not induce (B) catalepsy or (D) hypothermia in paclitaxel-treated CB1KO mice. PTX, paclitaxel; Veh, vehicle. Data are expressed as mean ± S.E.M. (n = 4–7 per group). *P < 0.05 versus vehicle; +P < 0.05 versus CP55,940 (0.3 mg/kg, i.p. ), one-way analysis of variance followed by Bonferroni post hoc test. 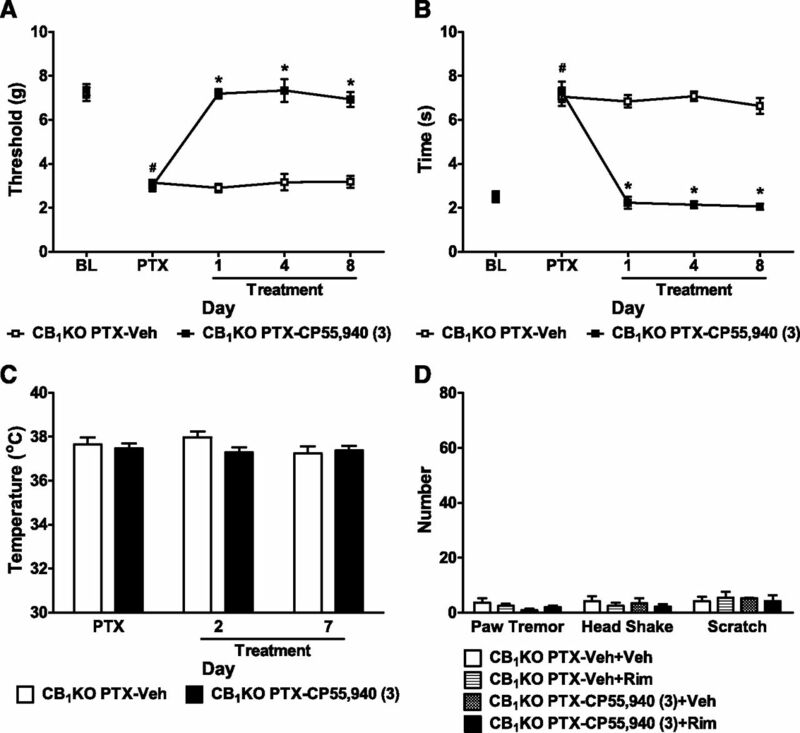 Acute CP55,940 Dose-Dependently Suppressed Paclitaxel-Induced Neuropathy in CB1KO Mice. In CB1KO mice, acute systemic treatment with CP55,940 suppressed paclitaxel-induced mechanical (F4,21 = 11.19, P < 0.0001; Fig. 7A) and cold (F4,21 = 12.61, P < 0.0001; Fig. 7B) allodynia in a dose-dependent manner. Low-dose CP55,940 (0.3 mg/kg, i.p.) failed to attenuate paclitaxel-evoked allodynia relative to vehicle (P > 0.84 for both modalities) in CB1KO mice (Fig. 7, A and B). Medium-dose CP55,940 (1 mg/kg, i.p.) partially attenuated paclitaxel-induced mechanical and cold hypersensitivities in CB1KO mice (P < 0.01; Fig. 7, A and B). Higher doses of CP55,940 (3 or 10 mg/kg, i.p.) fully reversed paclitaxel-induced mechanical and cold allodynia in CB1KO mice relative to vehicle (P < 0.0001) and normalized responses to prepaclitaxel levels (P > 0.49; Fig. 7, A and B). WT mice treated with CP55,940 (3 mg/kg, i.p.) exhibited severe catalepsy and thus were not used for the assessments of mechanical and cold allodynia. Acute CP55,940 produced dose-dependent antiallodynic effects in paclitaxel-treated CB1KO mice. Dose response of CP55,940 (0.3, 1, 3, and 10 mg/kg, i.p.) on paclitaxel-evoked (A) mechanical and (B) cold allodynia in CB1KO mice. BL, prepaclitaxel baseline PTX, postpaclitaxel baseline; Veh, vehicle. Data are expressed as mean ± S.E.M. (n = 4–7 per group). *P < 0.05 versus vehicle; +P < 0.05 versus CP55,940 (1 mg/kg, i.p. ), one-way analysis of variance followed by Bonferroni post hoc test. 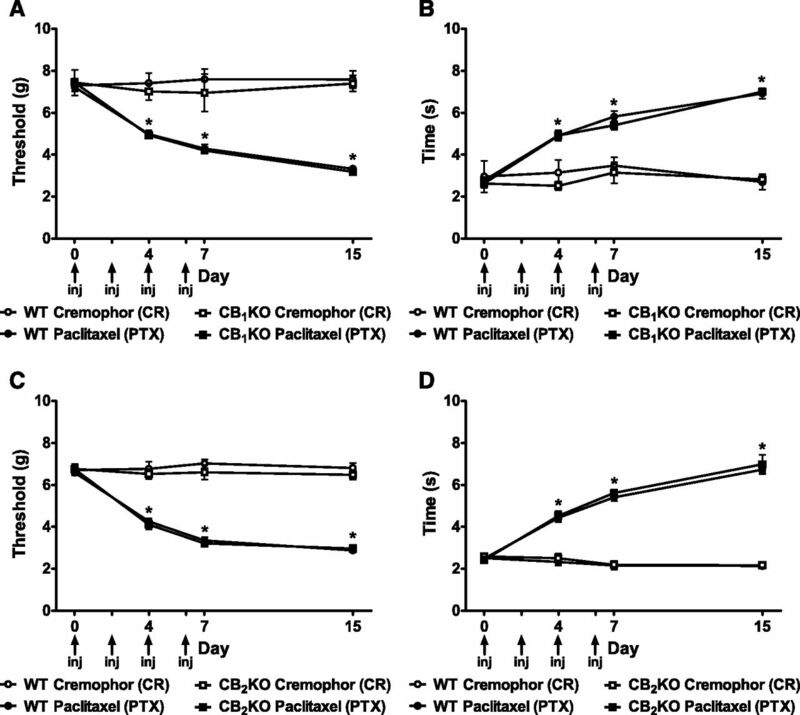 Chronic High-Dose CP55,940 Suppressed Paclitaxel-Induced Allodynia in CB1KO Mice. In CB1KO mice, chronic high-dose treatment with CP55,940 (3 mg/kg daily, i.p.) reversed paclitaxel-induced mechanical (F1,10 = 110.07, P < 0.000; Fig. 8A) and cold (F1,10 = 98.41, P < 0.0001; Fig. 8B) hypersensitivities relative to vehicle (P < 0.0001 for all comparisons) and preinjection levels (F4,40 = 24.88, P < 0.0001 mechanical; F4,40 = 60.38, P < 0.0001 cold). The antiallodynic effects of high-dose CP55,940 were stable throughout the chronic dosing regimen (F2,20 = 0.41, P = 0.67 mechanical; F2,20 = 0.74, P = 0.49 cold). High-dose CP55,940 fully suppressed paclitaxel-induced allodynia and restored responses to prepaclitaxel baseline levels (F3,24 = 0.31, P = 0.82 mechanical; F3,24 = 0.97, P = 0.51 cold; Fig. 8, A and B). In CB1KO mice, high-dose CP55,940 suppressed paclitaxel-induced allodynia without producing hypothermia or rimonabant-elicited precipitated withdrawal symptoms. (A and B) CP55,940 (3 mg/kg day, i.p. × 8 days) reversed paclitaxel-induced (A) mechanical and (B) cold allodynia in CB1KO mice. (C and D) CP55,940 (3 mg/kg day, i.p. × 9 days) did not alter (C) body temperature or (D) produce rimonabant-elicited precipitated withdrawal symptoms in CB1KO mice. BL, pre paclitaxel baseline; PTX, postpaclitaxel baseline; Veh, vehicle. Data are expressed as mean ± S.E.M. (n = 4–7 per group). *P < 0.05 versus vehicle, two-tailed t test. #P < 0.05 versus prepaclitaxel baseline, repeated-measures analysis of variance. Chronic high-dose treatment with CP55,940 (3 mg/kg daily, i.p.) did not alter body temperature in paclitaxel-treated CB1KO mice on any day tested (F1,6 = 0.79, P = 0.41; Fig. 8C). Moreover, rimonabant challenge did not induce paw tremors (F3,12 = 1.37, P = 0.30), headshakes (F3,12 = 0.40, P = 0.75), or scratching bouts (F3,12 = 0.14, P = 0.93) relative to vehicle challenge in CB1KO mice receiving chronic treatment with either CP55,940 (3 mg/kg daily, i.p.) or vehicle (Fig. 8D). Antiallodynic Effects of High-Dose CP55,940 in CB1KO Mice Were Mediated by CB2 Receptors. In paclitaxel-treated CB1KO mice, the antiallodynic effects of high-dose CP55,940 (3 mg/kg daily, i.p.) on mechanical (F3,17 = 88.50, P < 0.0001; Fig. 9A) and cold (F3,17 = 59.44, P < 0.0001; Fig. 9B) hypersensitivities were blocked by the CB2 antagonist AM630 (5 mg/kg daily, i.p.) at all time points (P < 0.0001). AM630 (5 mg/kg daily, i.p.) alone did not alter mechanical or cold responsiveness relative to vehicle (P = 1.00 for all comparisons) in CB1KO mice (Fig. 9, A and B). Antiallodynic effects of high-dose CP55,940 in CB1KO mice were mediated by CB2 receptors. In CB1KO mice, high-dose CP55,940 (3 mg/kg daily, i.p. × 8 days)-induced suppressions of paclitaxel-evoked (A) mechanical and (B) cold allodynia were blocked by the CB2 antagonist AM630 (5 mg/kg daily, i.p. × 8 days). BL, prepaclitaxel baseline; PTX, postpaclitaxel baseline; Veh, vehicle. Data are expressed as mean ± S.E.M. (n = 4–7 per group). *P < 0.05 versus vehicle; xP < 0.05 versus CP55,940 (3 mg/kg, i.p. ), one-way analysis of variance (ANOVA) followed by Bonferroni post hoc test. #P < 0.05 versus prepaclitaxel baseline, repeated measures ANOVA. Psychotropic effects have represented significant hurdles for advancing cannabinoids as pharmacotherapies (Dhopeshwarkar and Mackie, 2014). Tolerance develops to CB1-mediated locomotor effects of CP55,940 and Δ9-tetrahydrocannabinol (Δ9-THC) and is accompanied by downregulation of cannabinoid receptor binding sites in the absence of nerve injury (Oviedo et al., 1993). If tolerance develops differentially to psychotropic effects and therapeutic effects of cannabinoids, the clinical potential of these agents would be enhanced. A better understanding of the receptor mechanisms underlying the therapeutic and side effect profiles of cannabinoids observed with chronic dosing may improve current pharmacotherapies and validate novel targets (Ben Amar, 2006; Pertwee, 2009). In the present study, we used CP55,940, a potent synthetic cannabinoid with equal affinities for mouse CB1 and CB2 receptors in vitro (Abood et al., 1997; Griffin et al., 2000), and knockout mice to study the pharmacological effects associated with activation of distinct cannabinoid receptor subtypes in a model of paclitaxel-induced neuropathic pain. CP55,940 at a dose of 0.3 mg/kg i.p. suppressed paclitaxel-induced allodynia and produced undesirable side effects (i.e., hypothermia and physical withdrawal) through activation of CB1 receptors. Interestingly, we unmasked a novel CB2-mediated component of CP55,940-induced antiallodynic effects through the use of CB1KO mice. CP55,940 at a dose of 3 mg/kg i.p. (i.e., 10 times higher than the dose producing CB1-mediated pharmacological effects in WT mice) activated CB2 receptors and produced antiallodynic effects in CB1KO mice. This desirable therapeutic profile of CB2-mediated antiallodynic efficacy was sustained after chronic dosing and was not accompanied by adverse cannabimimetic effects typical of CB1 receptor activation. In our study, low-dose CP55,940 (0.3 mg/kg per day, i.p.) suppressed paclitaxel-induced allodynia in WT and CB2KO, but not in CB1KO mice, suggesting that the antiallodynic effects at this low dose were mediated solely by CB1, without a contribution from CB2 receptors. Moreover, activation of CB1 receptors was sufficient to fully reverse paclitaxel-induced neuropathic pain behaviors. Our results confirmed a previous study showing that CP55,940 at this dose produces CB1-mediated antinociception in various pain models (Sain et al., 2009). These results are in agreement with previous reports suggesting that CP55,940 produces antinociceptive effects via CB1 receptors (Lichtman and Martin, 1997; Romero et al., 2002; Choong et al., 2007; Sain et al., 2009). Mixed cannabinoid agonists can produce CB1-mediated antinociception through central and peripheral mechanisms (Fox et al., 2001; Lim et al., 2003) and suppress central sensitization in spinal dorsal horn neurons (Chapman, 2001) in neuropathic pain models. CP55,940 at a 10-fold higher dose (3 mg/kg daily, i.p.) produced severe catalepsy in WT but not in CB1KO mice, consistent with previous reports on CB1-mediated catalepsy (Oviedo et al., 1993; Lichtman and Martin, 1997). Cataleptic effects of CP55,940 were absent in CB1KO mice; we therefore used CP55,940 in conjunction with CB1KO mice as a tool for studying CB2-mediated signaling in isolation from CB1 receptors (i.e., without the confounding effects of the drug on motor behavior). CP55,940 administered at the higher dose produced antiallodynic effects in CB1KO mice. Moreover, these antiallodynic effects were blocked by the CB2 antagonist AM630, suggesting that CP55,940 at the higher dose engages CB2 receptors to produce antiallodynic effects. Our results are in line with a previous study showing that both CB1 and CB2 receptors are involved in the actions of CP55,940 on acute pain and spinal nerve ligation-induced neuropathic pain (Scott et al., 2004). Activation of spinal and/or peripheral CB2 receptors by CB2 agonists, after acute or chronic administration, suppresses neuropathic pain (Yamamoto et al., 2008; Hsieh et al., 2011; Landry et al., 2012; Deng et al., 2015). CB2 agonists are likely to suppress neuropathic nociception by downregulation of proinflammatory cytokines and chemokines (Klegeris et al., 2003; Eljaschewitsch et al., 2006; Wilkerson et al., 2012; Deng et al., 2015) as well as inhibition of central sensitization (Elmes et al., 2004; Nackley et al., 2004). CP55,940 binds with similar affinity to mouse CB1 (Kd = 0.77 nM) (Abood et al., 1997) and CB2 receptors (Kd = 0.73 nM) (Griffin et al., 2000) in in vitro assays. This relationship also holds for human CB1 and CB2 receptors (Felder et al., 1995). Interestingly, in our in vivo study, a 10-fold higher dose of CP55,940 was required to produce CB2-mediated antiallodynic efficacy relative to CB1-mediated antiallodynic efficacy. Thus, low-dose CP55,940 preferentially engaged CB1-mediated processes, consistent with the high expression levels of CB1 compared with CB2 in the CNS (Galiegue et al., 1995; Schatz et al., 1997; Marsicano and Lutz, 1999; Onaivi et al., 2006). At a higher dose, CP55,940 suppresses pain by triggering CB2 signaling in addition to the CB1-mediated mechanism. Indeed, in an inflammatory pain model, CB2 receptors are involved in the peripheral antihyperalgesic actions of a mixed CB1/CB2 agonist WIN55,212-2 [(R)-(+)-[2,3-dihydro-5-methyl-3-(4-morpholinylmethyl)pyrrolo[1,2,3-de]-1,4-benzoxazin-6-yl]-1-napthalenyl-methanone], when administered locally in the paw, under conditions in which central CB1 receptors would not be activated (Nackley et al., 2003). We postulate that the higher dose of systemic CP55,940 activates both CB1 and CB2 receptors, but the beneficial antinociceptive effects (mediated by both CB1 and CB2) are masked by CB1-mediated cataleptic effects. As expected, CP55,940 produced hypothermia in WT, but not CB1KO mice (McGregor et al., 1996; Rawls et al., 2002; Varvel et al., 2005). By contrast, chronic CP55,940, at a dose that produced CB2-mediated antiallodynic efficacy, failed to decrease body temperature in CB1KO mice, documenting that prolonged activation of CB2 receptors does not result in hypothermia (Malan et al., 2001; Valenzano et al., 2005; Yao et al., 2009; Elliott et al., 2011; Kinsey et al., 2011; Amenta et al., 2012). Chronic CP55,940-treated WT, but not CB1KO mice, showed profound withdrawal signs when challenged with the CB1 antagonist rimonabant, suggesting precipitation at CB1 receptors produces withdrawal symptoms (Tsou et al., 1995; Aceto et al., 1996; Cook et al., 1998; Rubino et al., 1998; Lichtman et al., 2001). Interestingly, although rimonabant challenge preferentially increased scratching bouts in mice treated with CP55,940 compared with vehicle, rimonabant-elicited scratching was notably absent in CB1KO mice, demonstrating that antagonist-induced scratching [analogous to pruritis (Proietto et al., 2010)] in the absence of chronic cannabinoid dosing is mediated by CB1 receptors, rather than an off-target effect of rimonabant. Our studies are the first to evaluate possible signs of physical dependence in animal pain models associated with repeated systemic activation of CB2 receptors [present data and (Deng et al., 2015)]. These studies provide strong evidence that activation of CB2 receptors produce substantial antiallodynic efficacy independent of CB1 receptors. One of the common features of G-protein–coupled receptors is that prolonged exposure to their agonists lead to the development of tolerance (Taylor and Fleming, 2001; Martin et al., 2004). A striking observation of our study was that tolerance to the therapeutic effects of CP55,940 (0.3 mg/kg daily, i.p.) occurred later than tolerance to its psychotropic effects. Our results, along with published reports (Bass and Martin, 2000; McKinney et al., 2008; Nguyen et al., 2012), suggested that the time course of tolerance may vary between different CB1-mediated pharmacological effects (e.g., analgesia, hypothermia, hypoactivity). Interestingly, using the same mouse model of paclitaxel-induced neuropathy, complete tolerance developed to both antinoiceptive and hypothermic effects of the prototypical cannabinoid Δ9-THC over 8 days (Deng et al., 2015). CP55,940 and Δ9-THC differ in potency at CB1 receptors (Wiley et al., 1995; Darmani et al., 2007) and tolerance development (De Vry et al., 2004). Ligand-dependent differences in tolerance development for different pharmacological effects may be attributed to the different signaling pathways recruited by CB1 receptors (Martin et al., 2004) and regionally specific differences in receptor density and/or efficacy (Oviedo et al., 1993; McKinney et al., 2008). For instance, CP55,940 and Δ9-THC differ in CB1 receptor internalization (Hsieh et al., 1999) and inhibition of adenylyl cyclase activity (Sim et al., 1995; Childers and Deadwyler, 1996; Fan et al., 1996; Breivogel et al., 1998; Rubino et al., 2000a,b), whereas these ligands act similarly with respect to other CB1 signaling pathways, such as extracellular-signal-regulated kinase activation (Rubino et al., 2005; Daigle et al., 2008). More studies that correlate behavior observations and functional signaling changes are needed to understand tolerance associated with CB1 receptors. In addition to CB1-associated tolerance, the present report also asked whether the high-dose CP55,940 treatment in CB1KO mice would produce tolerance to CB2-mediated antiallodynic effects. Notably, no decrement in CB2-mediated antiallodynic effects was observed in CB1KO mice treated with daily administration of the high-dose CP55,940, similar to previous reports with CB2-preferring agonists (Yao et al., 2009; Deng et al., 2015). In conclusion, the present report demonstrated distinct roles of cannabinoid receptor subtypes in mediating the beneficial and adverse effects of CP55,940 in an animal model of paclitaxel-induced neuropathy. CP55,940 suppressed the maintenance of paclitaxel-induced neuropathic pain through both CB1- and CB2-dependent mechanisms. CB2-mediated antinociceptive effects were engaged at doses approximately 10 times higher than those required to produce CB1-mediated antinociception. On the other hand, CB1 but not CB2 receptors were engaged in CP55,940-produced hypothermia, catalepsy, and cannabimimetic physical withdrawal. Our results further demonstrate that CB2 receptors represent a potential therapeutic target for effectively and safely managing chemotherapy-induced neuropathic pain without unwanted effects. Participated in research design: Deng, Mackie, Hohmann. Wrote or contributed to the writing of the manuscript: Deng, Mackie, Hohmann. This work was supported by the National Institutes of Health [Grants R21-DA037673, K05-DA021696, R01-DA011322, R21-DA035068, and P01-DA009158]. (1997) Isolation and expression of a mouse CB1 cannabinoid receptor gene: comparison of binding properties with those of native CB1 receptors in mouse brain and N18TG2 neuroblastoma cells. Biochem Pharmacol 53:207–214. (1996) Dependence on delta 9-tetrahydrocannabinol: studies on precipitated and abrupt withdrawal. J Pharmacol Exp Ther 278:1290–1295. (2012) A cannabinoid type 2 receptor agonist attenuates blood-brain barrier damage and neurodegeneration in a murine model of traumatic brain injury. J Neurosci Res 90:2293–2305. (2012) Functional selectivity in CB(2) cannabinoid receptor signaling and regulation: implications for the therapeutic potential of CB(2) ligands. Mol Pharmacol 81:250–263. (2000) Time course for the induction and maintenance of tolerance to Delta(9)-tetrahydrocannabinol in mice. Drug Alcohol Depend 60:113–119. (2006) Cannabinoids in medicine: a review of their therapeutic potential. J Ethnopharmacol 105:1–25. (1998) Cannabinoid receptor agonist efficacy for stimulating [35S]GTPgammaS binding to rat cerebellar membranes correlates with agonist-induced decreases in GDP affinity. J Biol Chem 273:16865–16873. (2001) Functional changes in the inhibitory effect of spinal cannabinoid (CB) receptor activation in nerve injured rats. Neuropharmacology 41:870–877. (1996) Role of cyclic AMP in the actions of cannabinoid receptors. Biochem Pharmacol 52:819–827. (2007) Effect of CP55,940 on mechanosensory spinal neurons following chronic inflammation. Neurosci Lett 414:105–109. (1992) Aminoalkylindole analogs: cannabimimetic activity of a class of compounds structurally distinct from delta 9-tetrahydrocannabinol. J Pharmacol Exp Ther 263:1118–1126. (1998) CB1 receptor antagonist precipitates withdrawal in mice exposed to Delta9-tetrahydrocannabinol. J Pharmacol Exp Ther 285:1150–1156. (2007) Receptor mechanism and antiemetic activity of structurally-diverse cannabinoids against radiation-induced emesis in the least shrew. Eur J Pharmacol 563:187–196. (2004) Behavioral effects of cannabinoids show differential sensitivity to cannabinoid receptor blockade and tolerance development. Behav Pharmacol 15:1–12. (2015) Chronic cannabinoid receptor 2 activation reverses paclitaxel neuropathy without tolerance or cannabinoid receptor 1-dependent withdrawal. Biol Psychiatry 77:475–487. (2012) The maintenance of cisplatin- and paclitaxel-induced mechanical and cold allodynia is suppressed by cannabinoid CB₂ receptor activation and independent of CXCR4 signaling in models of chemotherapy-induced peripheral neuropathy. Mol Pain 8:71–82. (2014) CB2 Cannabinoid receptors as a therapeutic target-what does the future hold? Mol Pharmacol 86:430–437. (2006) The endocannabinoid anandamide protects neurons during CNS inflammation by induction of MKP-1 in microglial cells. Neuron 49:67–79. (2011) Acute effects of a selective cannabinoid-2 receptor agonist on neuroinflammation in a model of traumatic brain injury. J Neurotrauma 28:973–981. (2004) Cannabinoid CB2 receptor activation inhibits mechanically evoked responses of wide dynamic range dorsal horn neurons in naïve rats and in rat models of inflammatory and neuropathic pain. Eur J Neurosci 20:2311–2320. (2001) The role of central and peripheral cannabinoid1 receptors in the antihyperalgesic activity of cannabinoids in a model of neuropathic pain. Pain 92:91–100. (1995) Expression of central and peripheral cannabinoid receptors in human immune tissues and leukocyte subpopulations. Eur J Biochem FEBS 232:54–61. (2009) The endocannabinoid system and pain. CNS Neurol Disord Drug Targets 8:403–421. (1997) The analgesic effects of R(+)-WIN 55,212-2 mesylate, a high affinity cannabinoid agonist, in a rat model of neuropathic pain. Neurosci Lett 221:157–160. (1999) Cannabinoid suppression of noxious heat-evoked activity in wide dynamic range neurons in the lumbar dorsal horn of the rat. Journal of Neurophysiology 81:575–583. (2002) International Union of Pharmacology. XXVII: classification of cannabinoid receptors. Pharmacol Rev 54:161–202. (2011) Central and peripheral sites of action for CB₂ receptor mediated analgesic activity in chronic inflammatory and neuropathic pain models in rats. Br J Pharmacol 162:428–440. (2003) Reduction of human monocytic cell neurotoxicity and cytokine secretion by ligands of the cannabinoid-type CB2 receptor. Br J Pharmacol 139:775–786. (2012) Spinal cannabinoid receptor type 2 agonist reduces mechanical allodynia and induces mitogen-activated protein kinase phosphatases in a rat model of neuropathic pain. J Pain: official journal of the American Pain Society 13:836–848. (1999) Unresponsiveness to cannabinoids and reduced addictive effects of opiates in CB1 receptor knockout mice. Science 283:401–404. (1997) The selective cannabinoid antagonist SR 141716A blocks cannabinoid-induced antinociception in rats. Pharmacol Biochem Behav 57:7–12. (2001) Opioid and cannabinoid modulation of precipitated withdrawal in delta(9)-tetrahydrocannabinol and morphine-dependent mice. J Pharmacol Exp Ther 298:1007–1014. (2003) Upregulation of spinal cannabinoid-1-receptors following nerve injury enhances the effects of Win 55,212-2 on neuropathic pain behaviors in rats. Pain 105:275–283. (2005) Modulation of the cannabinoid CB2 receptor in microglial cells in response to inflammatory stimuli. J Neurochem 95:437–445. (1999) Expression of the cannabinoid receptor CB1 in distinct neuronal subpopulations in the adult mouse forebrain. Eur J Neurosci 11:4213–4225. (2004) Signaling pathways involved in the development of cannabinoid tolerance. Trends Pharmacol Sci 25:325–330. (2008) Dose-related differences in the regional pattern of cannabinoid receptor adaptation and in vivo tolerance development to delta9-tetrahydrocannabinol. J Pharmacol Exp Ther 324:664–673. (2003) A peripheral cannabinoid mechanism suppresses spinal fos protein expression and pain behavior in a rat model of inflammation. Neuroscience 117:659–670. (2004) Activation of cannabinoid CB2 receptors suppresses C-fiber responses and windup in spinal wide dynamic range neurons in the absence and presence of inflammation. J Neurophysiol 92:3562–3574. (2012) β-arrestin2 regulates cannabinoid CB1 receptor signaling and adaptation in a central nervous system region-dependent manner. Biol Psychiatry 71:714–724. (2006) Discovery of the presence and functional expression of cannabinoid CB2 receptors in brain. Ann N Y Acad Sci 1074:514–536. (1972) The ring test: a quantitative method for assessing the ‘cataleptic’ effect of cannabis in mice. Br J Pharmacol 46:753–763. (2009) Emerging strategies for exploiting cannabinoid receptor agonists as medicines. Br J Pharmacol 156:397–411. (2010) A clinical trial assessing the safety and efficacy of the CB1R inverse agonist taranabant in obese and overweight patients: low-dose study. Int J Obes (Lond) 34:1243–1254. (2002) CB1 receptors in the preoptic anterior hypothalamus regulate WIN 55212-2 [(4,5-dihydro-2-methyl-4(4-morpholinylmethyl)-1-(1-naphthalenyl-carbonyl)-6H-pyrrolo[3,2,1ij]quinolin-6-one]-induced hypothermia. J Pharmacol Exp Ther 301:963–968. (2002) Antinociceptive, behavioural and neuroendocrine effects of CP 55,940 in young rats. Brain Res Dev Brain Res 136:85–92. (2005) Ras/ERK signalling in cannabinoid tolerance: from behaviour to cellular aspects. J Neurochem 93:984–991. (1998) Cannabinoid-precipitated withdrawal: a time-course study of the behavioral aspect and its correlation with cannabinoid receptors and G protein expression. J Pharmacol Exp Ther 285:813–819. (2000a) Changes in the cannabinoid receptor binding, G protein coupling, and cyclic AMP cascade in the CNS of rats tolerant to and dependent on the synthetic cannabinoid compound CP55,940. J Neurochem 75:2080–2086. (2000b) Chronic delta-9-tetrahydrocannabinol treatment increases cAMP levels and cAMP-dependent protein kinase activity in some rat brain regions. Neuropharmacology 39:1331–1336. (2009) Antinociceptive effects of the non-selective cannabinoid receptor agonist CP 55,940 are absent in CB1(-/-) and not CB2(-/-) mice in models of acute and persistent pain. Neuropharmacology 57:235–241. (2009) Targeting fatty acid amide hydrolase (FAAH) to treat pain and inflammation. AAPS J 11:39–44. (2004) Evidence that CB-1 and CB-2 cannabinoid receptors mediate antinociception in neuropathic pain in the rat. Pain 109:124–131. (1995) In vitro autoradiography of receptor-activated G proteins in rat brain by agonist-stimulated guanylyl 5′-[gamma-[35S]thio]-triphosphate binding. Proc Natl Acad Sci USA 92:7242–7246. (2001) Unifying perspectives of the mechanisms underlying the development of tolerance and physical dependence to opioids. J Pharmacol Exp Ther 297:11–18. (1995) Physical withdrawal in rats tolerant to delta 9-tetrahydrocannabinol precipitated by a cannabinoid receptor antagonist. Eur J Pharmacol 280:R13–R15. (2005) Pharmacological and pharmacokinetic characterization of the cannabinoid receptor 2 agonist, GW405833, utilizing rodent models of acute and chronic pain, anxiety, ataxia and catalepsy. Neuropharmacology 48:658–672. (2005) Delta9-tetrahydrocannbinol accounts for the antinociceptive, hypothermic, and cataleptic effects of marijuana in mice. J Pharmacol Exp Ther 314:329–337. (2011) Cannabidiol prevents the development of cold and mechanical allodynia in paclitaxel-treated female C57Bl6 mice. Anesth Analg 113:947–950. (1995) Discriminative stimulus effects of CP 55,940 and structurally dissimilar cannabinoids in rats. Neuropharmacology 34:669–676. (2008) Chemotherapy-induced neuropathy. J Peripher Nerv Syst 13:27–46. (2008) Involvement of central cannabinoid CB2 receptor in reducing mechanical allodynia in a mouse model of neuropathic pain. Eur J Pharmacol 583:56–61. (2009) Characterization of a cannabinoid CB2 receptor-selective agonist, A-836339 [2,2,3,3-tetramethyl-cyclopropanecarboxylic acid [3-(2-methoxy-ethyl)-4,5-dimethyl-3H-thiazol-(2Z)-ylidene]-amide], using in vitro pharmacological assays, in vivo pain models, and pharmacological magnetic resonance imaging. J Pharmacol Exp Ther 328:141–151. (1989) Studies on hindered phenols and analogues. 1. Hypolipidemic and hypoglycemic agents with ability to inhibit lipid peroxidation. J Med Chem 32:421–428.